Calvin and Hobbes books (along with Garfield) are some of the most popular books in the school library. As a promotion for a new compilaton The Complete Calvin and Hobbes, Bill Watterson has authorized, sort of, a return of the comic strip to some papers through the end of December 2005. The Detroit Free Press has a nice article about the comic. Watterson stopped drawing the strip in 1995. "Calvin and Hobbes" ran for just over a decade, from November 1985 until Dec. 31, 1995, when Watterson retired. He was in his mid-30s, at the top of his game, and has never been heard from again in public, thus becoming the comics' answer to "To Kill a Mockingbird" author Harper Lee. Cartoonist Jef Mallett has some great comments about Watterson and his impact. "It would be difficult to single out any one thing," Mallett says, "but if you want to boil it down it was respect for the readers." Watterson has not licensed his characters. Watterson isn't starving. The 17 books -- the complete collection will be the 18th -- have sold a combined 30 million copies, according to Andrews McMeel. 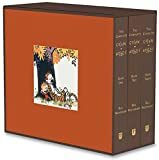 The initial press run of "The Complete Calvin and Hobbes" is 250,000 copies. Revenue from T-shirts, coffee mugs, greeting cards, lunch boxes, film, TV, video games and DVDs almost certainly could reach the hundreds of millions, but Watterson took a pass. Oh! I *LOVE* Calvin & Hobbes! I was sad when Watterson ended the strip, but glad he didn't shove Calvin & Hobbes everything merchandise at the public. (Even though I was in High School at the time and would have loved to have a C&H t-shirt.) I think it would have ruined the integrity of a wonderfully clever and humorous comic strip. I'll really have to remember the collection that's just come out, I only got around to collecting 2 or 3 of the books. Thanks for posting this. You know, I didn't realize that Watterson was that young when he quit writing C&H.